Grease a 9x9 square baking pan. I like to line it with parchment paper with overhanging edges so I can remove it from the pan easily. Melt the butter in a large microwave safe bowl in the microwave. Whisk in the sugar, then the salt, and the egg. When it is well combined, whisk in the cocoa powder. Then fold in the flour. Spread the batter evenly in the pan and bake for about 15 minutes. It will start to look cooked around the edges. Don't over bake. Set aside while you make the topping. 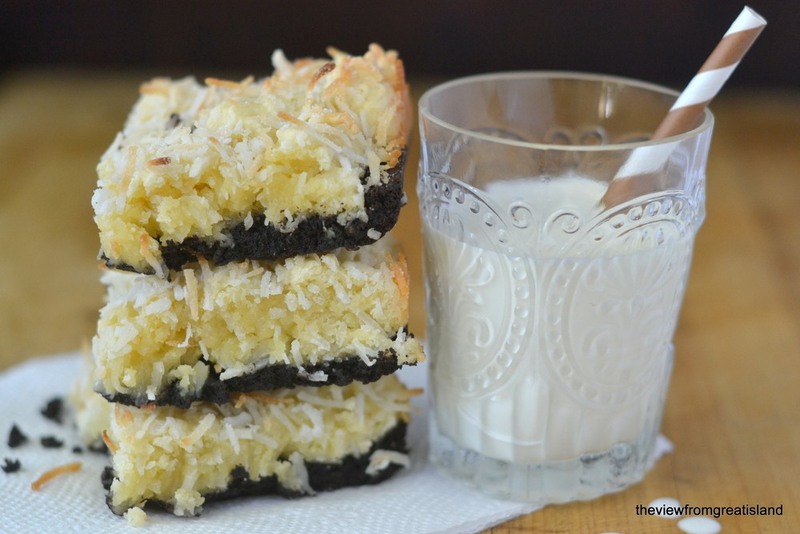 Drop the coconut mixture in small mounds all over the brownie layer. I used a small scoop to portion out small mounds. Sprinkle with the reserved coconut. Bake for another 25 to 30 minutes until a toothpick comes out clean.